In the first of a series of columns, Margaret Robertson, videogame writer and consultant, and the former editor of Edge magazine, gives a personal view of why she plays games. I've been in love with games for half my life. In the time it's taken me to get from a swotty kid to a professional journalist, they've been a hobby and a job, a distraction and an inspiration. They've made me friends, taught me Chinese history, and helped me conquer my phobia of slugs. But the more I play, the more I'm struck by an unavoidable realisation. Games are rubbish. Really, dismally, rubbish. They're expensive. Extraordinarily expensive, once you factor in the hardware you need to play them. They're massively - and awkwardly - time consuming. There are games with 24 hour day/night cycles which you may need to play at particular times. There are games with badly spaced save-points so you're left with the choice of switching off when it suits you and losing an hour of progress, or playing on even if it doesn't. And they're boring. So, very, very boring. Even setting aside the fact that all you do is sit still and twitch your fingers, for hours on end, there's the fact that what you do in games is so relentlessly repetitive. Kill the same enemies hundreds and hundreds of times. Race round and round and round the same circuits. And then you buy a new game, with new exciting possibilities, and you kill some new enemies hundreds and hundreds of times, and race round some new tracks till you're dizzy. And - here's the kicker - games aren't just boring, inconvenient, and over-priced. They're designed to make you feel like a failure. There's a very good chance - a certainty in most games - that there will come a point where the game will beat you. Where you'll sit in your own house while a bit of software you paid big money for, and devoted hours to, calls you a loser. Why on earth would you want to do this stuff? Everyone has their own answer to that, of course - that the violence is therapeutic, that the levelling-up is good for your self esteem, that the stories are better than they're reputed to be, that the spectacle on offer outdoes the best that producer Jerry Bruckheimer has to offer. But my answer is considerably swottier than that. It's that games are educational. It's not what they teach - since what they teach (a smattering of Chinese history excepted) is largely useless. It's that they teach. Brains love to learn. For everyone, there's some kind of learning that is as satisfying for their brains as running all day is for a border collie. It might be rote, factual learning, soaking up thousands of item stats and proc rates; it might be wordless, spatial learning, perfecting the arc of grenade. It might be tessellating and testing strategies for defeating Rome or building New York; it might be pattern recognition, nailing combos in Virtua Fighter or bass lines in Amplitude. And once you find the one that suits you, the feeling is narcotic. Brains love information - finding connections, mapping relationships - and games let you mainline a fat flow of pure, perfected data, all deliberately contrived to be rich with exactly those kinds of interconnections. And as you learn, you're given an incredible window into your own capabilities. Games are a test-bed where you can endlessly explore what an extraordinary machine you are. 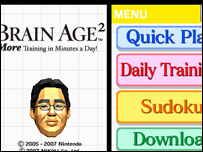 Take something like Nintendo's Brain Training. The 'low to high' test shows you a grid of numbers for two or three seconds, then blanks them out, and you need to tap the boxes in the order, low to high, of the numbers they contained. When I play it, I know, as a matter of certainty, that I can't do it. I don't even have time to read the numbers, let alone order them, let alone memorise them. But somehow, even though I can't do it, my brain can. Check me out - I'm amazing. And that's not arrogance. I don't take any credit for it. I can't. Same as I can't take credit for the million biological and chemical wonders that my body sorts out for me day in, day out, and the gallons of maths and physics my brain processes to get me across a road safely. Games let you be a spectator in your own head. They're laboratories which let you contrive test after test - tweak a condition here and a parameter there - and give you a visible, beautiful read-out on just how smart your brain really is. And in doing that, they give you more insight into your own capabilities than I've ever found in any work of literature or any piece of music. And that's why I play games.